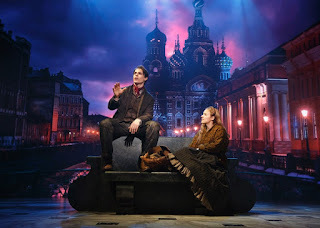 Before the new musical “Anastasia” begins, the audience enters the theatre as if to walk onto the pages of a storybook. In fact, the tale of Anastasia, the very real and presumably executed Russian princess of the early 20th century, may or may not be folklore. The ultimate decision is that of each individual (a full house at Sunday’s matinee) at Hartford Stage. The creative team of director Darko Tresnjak, scenic designer Alexander Dodge, and choreographer Peggy Hickey – all of Hartford’s Tony Award winning Best Musical “Gentleman’s Guide to Love and Murder” – had better buy their tuxes or fancy duds as they undoubtedly will again head to NYC, to sold out houses, and to countless accolades. The Disneyfication of cartoon movies morphing into Broadway musicals has become a staple for theatergoers. Never having seen the cartoon motion picture, yet remembering the Ingrid Berman version, it seems a good guess that this musical combines elements of both, adding its own charm. “Anastasia” combines a bit of a “My Fair Lady” plot with some powerhouse “Les Miz-like” music. Without feeling crammed or rushed, the musical has so much that’s wonderful going for it; i.e. love story, mystery, renewed romance, family, and history. A cast of 40, song list of 30, band (more like an orchestra) of nearly 20, and six lead actors make “Anastasia” excel beyond anticipation. Christy Altomare’s Anastasia looks like Grace Kelly and sings like Julie Andrews. Derek Klena (Dmitry) and John Bolton (Vlad) team up as delightful amateur scoundrels. This triumvirate is the crux of the story. Manoel Felciano (Gleb) acts the emotionally tortured soldier perfectly. The audience must wait until mid-musical for Caroline O’Connor (Lily) to take the stage as effervescent comic relief. Finally, Mary Beth Piel portrays the grandmother who, one upon a time was Empress. Director Tresnjak’s hand molds the musical’s shape, sound, and spirit. A constantly changing backdrop tableau of static pictures, movement, and shadows is exquisite. Sections of flats smoothly slide in and out, turn, and circle as season’s and settings change. A smorgasbord of more kudos: sound, lights, lush period costumes, chorus numbers to click your heels up, and “Swan Lake.”. Two short linguistic points to make – no attempt is made at Russian accents (thank you), and every lyric is enunciated flawlessly. 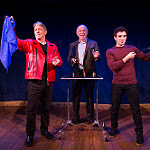 The world premiere of the musical “Presto Change-O” at Barrington Stage Company’s St. Germain Stage is quite literally, magic, illusion, and pure fun. The cast is composed of Broadway veterans who draw the audience into the story of three generations of magicians, each of whom demonstrate a style of magic or illusion representative of their own generation, and remind us that a magician has to make us believe magic is real. At the same time, the story is one of family love and betrayal, reminding us that sometimes, real families need a little magic. Getting a new musical off of the ground is tantamount to levitation, and the seeds of “Presto-Change-O” were originally planted at the Musical Theatre Lab at BSC. Eric Price’s book and lyrics are clever, intelligent, and witty; and Joel Waggoner’s musical compositions are contemporary and original. Director Marc Bruni skillfully establishes an energetic pace with effective flashbacks that give the story emotional depth. The unseen live five-piece band led by Vadim Feichtner is as good as it gets, and every aspect of the production from set design to the many magical illusions draw you deeper into the story. The perfectly cast show features performers who you believe could be a family. The charismatic Lenny Wolpe, the suave Michael Rupert, and the hunky Jarrod Spector are the three magicians, while Barbara Walsh as the mother and Jenni Barber as the assistant who wants to be the one to say “ta da” have great moments of connection on stage. Bob Walton’s comic timing enhances the surprises that drive the plot, and the voices all blend together in complex harmonies that are true to the identities of the characters. It is rare to see a musical with such flash played on such an intimate stage, and if I have any criticism at all, it’s that the volume of the electronically amplified voices somewhat overwhelmed the space, but this is a show destined to go far, and to play to larger houses. This original production reminds us that theatre is most assuredly a place where magic can happen. 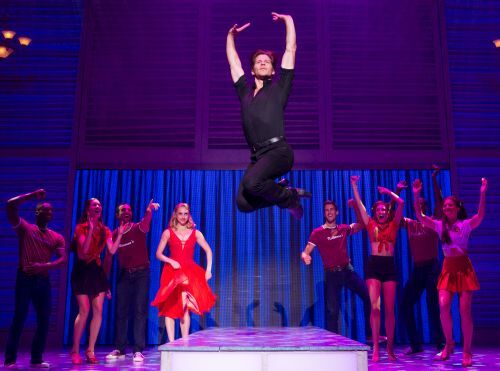 A more faithful transfer of a movie to the stage could not be found than this presentation of “Dirty Dancing” and judging from the reaction and energy of the audience, they would have it no other way. Original screenwriter Eleanor Begstein created this “stage event” to fill the need of what she saw as the “viewing audience’s desire to be more physically involved in the story.” So she crafted a show that is not quite a musical or concert, not quite a dance review, but a unique recreation of the 1987 film that tells the tale of a young girl’s coming of age at a 1960s Catskill resort. Entire scenes, costumes, dialogue, and staging are transferred, whole cloth, to the stage, with varying degrees of success. Rachel Boone as “Baby” is a true Doppelganger for the film’s Jennifer Grey. While Christopher Tierney is not quite as faithful a reproduction of Patrick Swayze’s “Johnny”, the catcalling female members of the audience had no problem with his presence. Both performers were fine dancers and did admirably in roles that called for them to literally imitate at times the celluloid performances. The show works best when the youthful cast is kicking up their heels, recreating dance numbers and set pieces. A few of the stage tricks employed to accomplish this were done with some self-awareness, as if to say “we know we can never do this justice on stage, but you’ll forgive us because you know that as well as we do.” Other settings, such as Baby practicing as she crosses a bridge were quite effective. There are over 40 (!) songs, fragments, or musical interludes throughout the show, most using the original 1960’s recordings. Some, including the well known “Time of My Life” and “In The Still of the Night” were live-sung by Doug Carpenter or Adrienne Walker (or both), but the songs were used more like a movie soundtrack, underscoring the action rather than overtly expressing any inner dialogue. Carpenter and Walker’s talent was undeniable and appreciated in those times they brought the soundtrack to full life. One need not have watched the original film dozens of times using an old VHS copy in the basement or dorm room to enjoy the show, but it will thrill you more when Baby makes the inevitable final leap into Johnny’s arms. With music and lyrics by Stephen Sondheim and a book by James Lapine, “Into the Woods” made its Broadway debut in 1987, winning Tony Awards for Best Score and Best Book. A mashup of several classic fairy tales by the Brothers Grimm and Charles Perrault, it has been produced locally and regionally more often than almost any other Sondheim show, and it inspired the 2014 film. 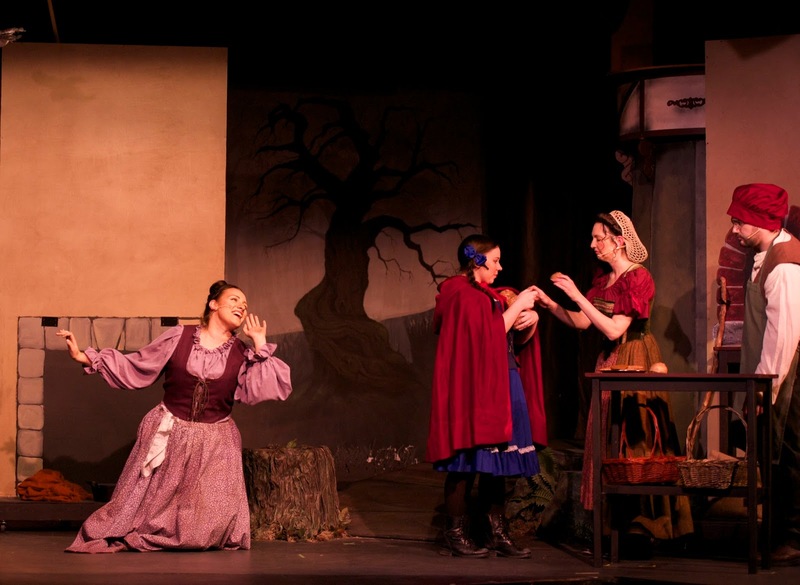 The large cast of familiar characters makes “Into the Woods” a great ensemble piece, and artistic director Sharon FitzHenry has assembled a marvelous cast of singing actors for this production. Lindsay Botticello brings a clarion voice and sharp characterization to the central role of the witch, who has cast a spell on her next-door neighbors, a baker and his wife, so that they can never have children. A quest she sends them on to reverse the spell sets the plot in motion. Michael Graham Morales is vulnerable and sensitive as the baker, and Nikki Wadleigh touching and resourceful as his wife. Among the characters they meet as their quest leads them “into the woods” are: Little Red Riding Hood, brightly played by Kellie Comer; Jack, of beanstalk fame, played with youthful innocence by Randy Davidson; and Cinderella, invested with growing maturity by Chelsea Kelle. The set design by Francisco Aguas and Dawn Bird is ingeniously simple and flexible. Choreography is uncredited but clever and imaginative, especially when most or all of the 19 cast members are on stage during the ensemble numbers. 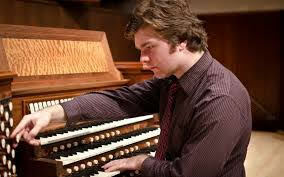 And musical director Bill Martin leads a finely-tuned and impressively larger-sounding band of three. This brilliant production will appeal to thoughtful musical theatre audiences of all ages. 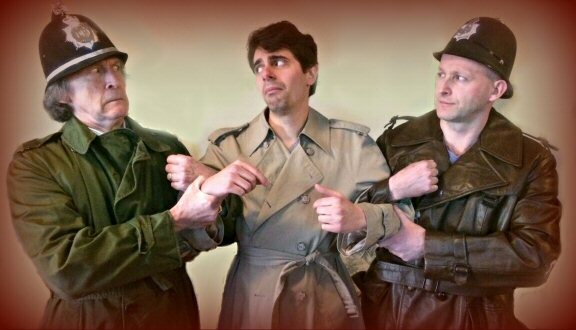 If any local community theatre troupe can handle the character changes, set intricacies, and fast-paced plot twists of “The 39 Steps” it is Suffield Players. The play begins with an actor standing in profile as Alfred Hitchcock, director of the 1930’s film of the same name. Interestingly, nearly all of the scenes and a good deal of the dialog are taken directly from the silver screen and placed on the theatre stage. Yet, there is one huge difference. As taut and sinister as the film is, the play is (for the most part) a raucous comedy. Under the cloud of WWII rumblings enters our hero, a dapper 20-something with a curl on his forehead named Hannay. Soon to arrive is a damsel in distress – a woman of typical intrigue, a taste for fish, and an ax to grind. The setting is Scotland, which offers the actors the opportunity to intentionally mangle the accents. Three actors round out the cast, each portraying about 10 characters each. These are the “Clowns.” It is their job to keep the action as fast and furious as they are able to change costumes. Director Roger Ochs’ cast showcase a mix of “regulars” and “newbees.” In the latter category are the two leads, Tyler Wolfson and Libby Miserendino. Wolfson infuses his role with boyish charm, self-deprecating humor, and a bit of dim wit. Miserandino (in two roles) is equally effective as the femme fatal, later the no-nonsense love interest. Hopefully, audiences will see each actor on many more stages in the future. Barbara Gallow (Clown 1) is malleable and handles each character well. Konrad Rogowski (Clown 2) puts his comedic emphasis on vocalization especially when portraying females. Steve Wandzy (Clown 3) unabashedly uses physical humor by every means practical. Those familiar with Suffield’s venue recall its small stage which adds to the difficultly of numerous sets. A train scene works best (trust me, you have to see it). Yet box seats and a library are elevated too high from the first level of the stage that audience members must crane their necks. As for all of the successful backstage work, those on lights, sound, and costuming were keen on much to the shenanigans. Too often, playgoers don’t recognize these talented, unseen individuals. Kudos to them and to all.